In addition to the low overall injury rate, the study shows that the concussion rates for cheerleaders “were significantly lower in cheerleading (2.2 per 10K AE) than all other sports combined (3.8) and all other girls’ sports (2.7).” This information may come as a surprise to anyone who has been following cheerleading in the media, but not those who have been looking at actual data. The results of this study support the results found in the two other published concussion studies that include cheerleading1,2, where cheerleading was tied with another sport for having the lowest concussion rate in the study. 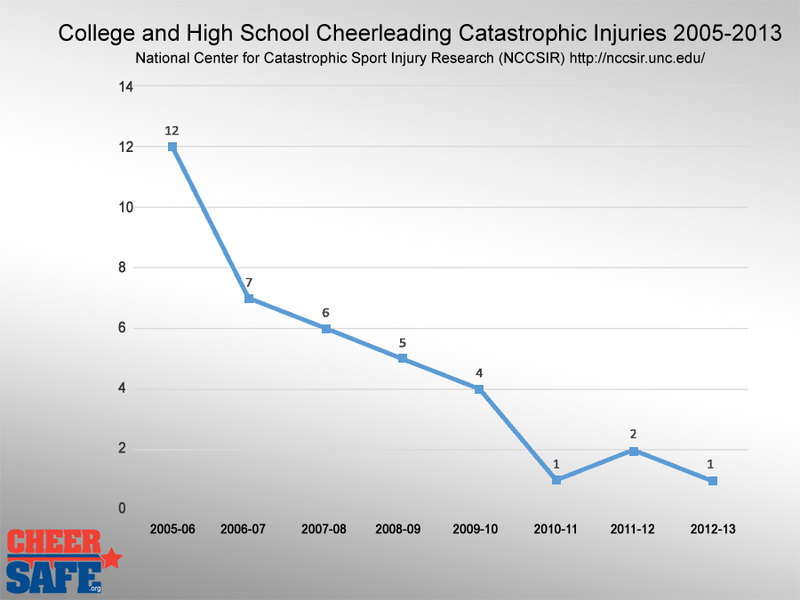 This, combined with the dramatic 10-year decline in the number of catastrophic injuries in cheerleading3, should show that cheerleading is not the high risk activity that has been portrayed in recent years. Yes, there is risk involved in cheerleading, just as there is in basketball, softball, football, gymnastics, soccer, and any other sport available today. However, that risk is no greater on average than the other sports listed. While this and other studies do reinforce the safety of cheerleading, the data provided by the study opens the door for opportunities to further improve cheerleading’s safety record. The study shows that concussions were a higher percentage of injuries in practice compared to cheering at games or competition. While this may be in part due to the nature of each event (learning new skills at practice vs. performing only skills which are mastered in games and competition), it gives us the opportunity to remind coaches and cheerleaders of the importance of using proper skill progressions and teaching spotting techniques that are appropriate for the skills being performed. Additional evidence-based study may help pinpoint specific areas where efforts can be targeted. The study data also show that while we have made great strides in keeping overall injury rates low, we can increase efforts to minimize the number of injuries that result in a loss of three weeks or more. The majority of these situations were due to concussion, which is an ongoing issue across all sports. During the span of the study, rules changes were enacted to help minimize the number of head injuries, which did drop slightly following the rule change. Cheerleading is a physical activity which involves body-to-body contact by nature and as such, there will always be some level of risk of injury. We believe this study and others like it confirm that our efforts in providing a safe framework of rules, an emphasis on safety awareness, and educational opportunities for coaches have had a positive impact. We will continue to monitor cheerleading safety and use the available data to further minimize the risk of injury in cheerleading and help keep cheerleaders safe. Lincoln, A.E., Caswell, S. V., Almquist, J.L., Dunn, R.E., Norris, J.B., & Hinton, R.Y. (2011). Trends in Concussion Incidence in High School Sports: A Prospective 11-Year Study. American Journal of Sports Medicine, 39(5), 958-963. Schulz, M.R., Marshall, S.W., Mueller, F.O., Yang, J., Weaver, N.L., Kalsbeek, W.D., * Bowling, J.M. (2004). Incidence and Risk Factors for Concussion in High School Athletes, North Carolina, 1996–1999. American Journal of Epidemiology, 160(10), 937-944. For more information on cheerleading safety, including research data, safety recommendations, and safety resources for coaches, parents, administrators, medical professionals, and cheerleaders, visit cheersafe.org.